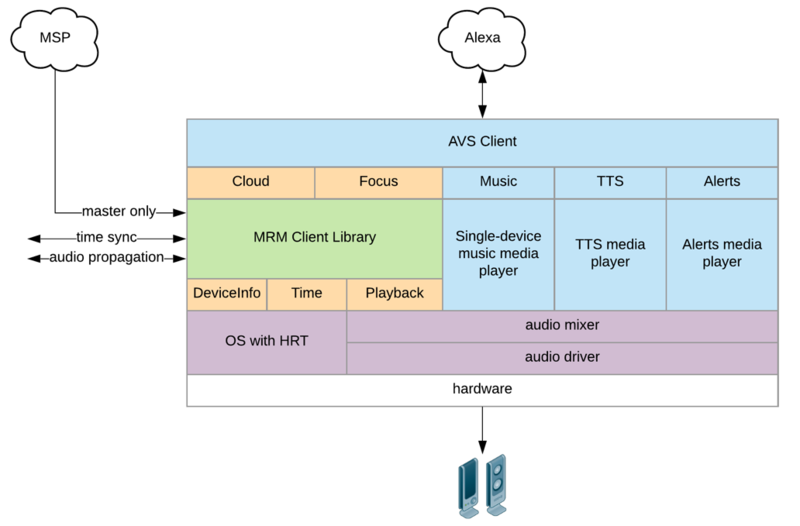 Multi-Room Music (MRM) enables synchronous playback of audio across multiple Alexa-enabled devices. This document introduces the MRM client library (also known as Whole Home Audio) and the delegate classes that are used to interface with the library. Note: The use of WHA in class names is historical. WHA is synonymous with MRM. The master is responsible for maintaining a connection with Alexa and propagating content across the local network to members of the group. It also determines when synchronized content should be rendered across group members. The slave is responsible for connecting to the master. The master is defined by Alexa, and master/slave/Alexa interactions are handled by the MRM library. Important: The MRM library is custom compiled for each hardware target and is provided as object code. CloudDelegate - Enables the exchange of directives and events between the MRM library and an AVS client. FocusDelegate - Exchanges application focus and playback state information between the MRM library and the AVS client. DeviceInfoDelegate - Provides device information, such as IP address. TimeDelegate - Surfaces the high-resolution timer functionality from the device or operating system. This class also holds the relative delay constants measured during unit testing. PlaybackDelegate - Receives timestamped audio output from the MRM client library. It is in the critical path of getting the current delay of the audio pipeline through the mixer and the audio driver and then using that delay plus the MRM synchronized time to send samples to the mixer down to the hardware at the right time such that they play in sync. LoggingDelegate - Captures logging messages produced by the MRM library for debugging. Tip: An implementation of each delegate class is available for Raspberry Pi. The PlayerDelegate class sample is particularly useful. It uses the TimeDelegate class to get the current timestamp, and determines whether to shorten the buffer or insert silence into the audio pipeline based on the timestamp. Device makers can request a custom build of the MRM client library that functions without an AVS client. Rather than expecting directives from Alexa, it connects to a device at specific network location. his custom build requires two customized Amazon Echo Dots. When compiled into a provided sample app and configured on the network according to instructions, a device running this build of the MRM client library will participate in an MRM group with the provided Dots. This configuration is useful for unit testing to test implementations of an audio pipeline. It also allows for early measurement of relative skew and drift between the device and the Echo Dots prior to implementation of the AVS client. The output of this skew testing should be included in the implementation of the TimeDelegate to set the default play offset. Upon request, Amazon will provide a version of the AVS Device SDK that is enabled to interact with the MRM client library. These versions implement the interface between the AVS Device SDK and the CloudDelegate and FocusDelegate classes.